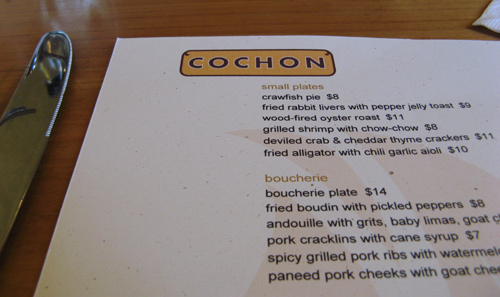 Cochon is simply delicious. 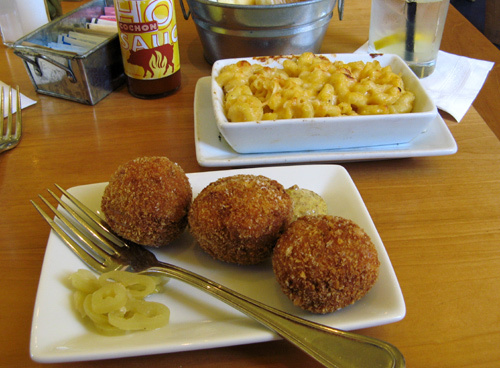 I started off with the gumbo, then moved on to the fried boudin and mac & cheese. The boudin is tender and spicy, with the perfect crispy exterior. And the mac & cheese is cheesy but not overpowering or cloyingly rich. The folks next to me had the boucherie plate and the ham hock–which is a very generous portion. And the folks on the other side of my table both had the oyster and bacon sandwich. They literally licked their lips and said, “yum” after the first bite. My hotel was located right down the street from Emeril’s Delmonico. And while yes, the man and his food is, in my opinion, a bit over-hyped, I went in during cocktail hour for 1/2 price drinks and small plates. Along with my drink I had the fried oysters and small plate of chorizo. The chorizo was good, but not earth-shattering, the oysters, however, were a different story. Perfectly cooked, crispy on the outside and tender and creamy on the inside. I have to admit they were the best fried oysters I’ve ever eaten. I also had the chance to get outside the tourist area and dine at Ralph’s on the Park. It’s a beautiful restaurant nestled across the street from City Park. I enjoyed the baked oysters and the crab beignets. The atmosphere is much more laid back than in other parts of the city and I was thrilled to dine among locals and talk city politics, post-Katrina life and cuisine. 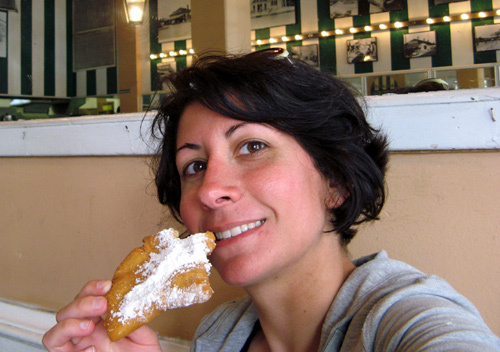 And of course, I made a trip to Cafe Du Monde for beignets. Sorry, no cafe au lait for me. I just don’t like coffee. And now on to Memphis for BBQ. New Orleans, I’ll be back for more next year!